Thought I'd create a home thread for news and discussion pertaining to space-based propulsion technology. I'll kick things off with an excellent in-depth Blog by wdgreene at NASA. Blue Origin to Launch Private Spaceship Test Flights this year. An intriguing VTOL chemical-based system. Darby » 08 Apr 2015, 03:08 wrote: Thought I'd create a home thread for news and discussion pertaining to space-based propulsion technology. Very cool Blog, tx Darby. I recommend reading it from the bottom of page 7, oldest first, otherwise one may lose the plot a little. The two communication satellites described in the article use Xenon, same propellant as the Dawn spacecraft. They use solar electric power to ionize Xenon gas and accelerate the ions out the back, producing thrust. The ions are accelerated to high speed, higher than with chemical propellants, so less mass is needed to generate the same momentum. Propellant is required but more efficient use is made of it. I'd like to see more investment in developing this propulsion technology. @Marshall: Yep, same as the Dawn probe. This was the first time it was used in a satellite application, and is likely to become the new gold standard for satellites & orbiting observatories needing to reach high orbits or Lagrange points. Personally, I'd VERY much like to see them get the much needed and long overdue ISS Propulsion Module back into fully funded status, and utilizing some form of high efficiency thruster technology. As best I can tell, its been repeatedly circling congressional funding priorities hell for some years now. Most recently, it looks like AdAstra was onboard for an attempt at a VASIMR version as recently as 2011, but it appears to have since been re-captured by the gravity well of negative congressional funding, and it quietly fell out of the news cycle again. You tax dollars, hard at non-work, despite a pressing need. Don't you just love congressional paralysis ? NOT. @BurtJordaan: You're very welcome. It's an excellent read. Solar Sail Technology: I see someone started a thread on IKAROS back in 2010. Good good. Just to tie a ribbon on this, the IKAROS completed its primary mission of passing venus back in Dec-2010, and slowly lost attitude control until the project went into hibernation in 2013. My own personal spin (pun intended) is that solar sail technology, if used at all, is really only viable in the inner solar system, and that the attitude control problems experienced by IKAROS could perhaps be resolved by pairing the technology with more recently developed electric thrusters, which could be used to not only boost primary thrust efficiency, but also (with some design mods) provide attitude control and/or thrust vectoring. The two seem like a natural complimentary pairing. Then again, since the speed achieved by the solar sail is paltry compared to the speeds achieved by electric thrusters, it seems more logical that the technology is more effective at generating additional electric power for the former than for providing primary thrust ... especially in light of new thin film PV technology, which is directly compatible with solar sail type thicknesses. Darby » April 8th, 2015, 10:36 am wrote: Solar Sail Technology: I see someone started a thread on IKAROS back in 2010. Good good. I'm not sure what you mean here by 'combining the technologies'. Solar sails can obtain any velocity desired up to solar escape. Electric thrusters have the advantage of high specific impulse, but you pay for that with a technology that is more expensive and operationally more limited. electric thrusters have the same limitation of any other chemical rocket: performance is limited to the total mass of usable propellant. Moonguy » April 8th, 2015, 12:31 pm wrote: I'm not sure what you mean here by 'combining the technologies'. I'm aware of the advantages and disadvantages of both technologies. My point of conjecture was this: adding an electric thruster to a probe fitted with a solar sail is directly analagous to fitting an inboard or outboard motor to a modern sailboat ... something that is now requisite industry default in all recreational sailboats beyond a certain size. The latest generation of thin film PV technology could be overlaid onto a solar sail to provide the requisite power needed to drive the thruster, and said thruster could greatly increase the specific impulse capability for primary maneuvers and also provide a source of power for attitude control (which is something IKAROS had problems maintaining and had to carry fuel for). It'd be a synergistic pairing having the advantage of both ambient environmental AND onboard propulsion ... the PV film kills 2 birds with one stone, and the added weight of the thruster would be greatly offset by the 10x efficiency increase over chemical thrusters. Such a pairing should (theoretically) have the ability to travel the entire length of the interplanetary transport network, and retain enough fuel to return home ... something we're not currently able to do with electric thrusters alone. It would be a very long duration mission, but it should be quite doable ... relying heavily on the sail for the outbound journey, and the electric thruster for the return, for course corrections and slingshot insertion maneuvers. Very doable. Returning it home brings up the issue of potential reuse. Is the suggestion here that it be refueled? Refueling at anywhere but the point of origin would necessarily require access to an orbital fuel depot somewhere, or a refueling tug similarly based ... and we currently have neither. Someday perhaps, but not today. Darby » April 8th, 2015, 12:56 pm wrote: Refueling at anywhere but the point of origin would necessarily require access to an orbital fuel depot somewhere, or a refueling tug similarly based ... and we currently have neither. Someday perhaps, but not today. Historically, Mars has gotten the lion's share of interest (aka money) so I think getting the thrust system back is practical for Mars missions. The remaining question is whether the cost of the logistical chain to support refueling for subsequent missions is justified. I would still favor solar sails for the application as there is no logistical chain needed to reuse the sails. Space money is getting scarcer and scarcer and notions of fueling depots and other infrastructure are fading fast. I truly wish it were otherwise. . . It is a chicken/egg kind of problem. Building a small base on Titan (Rhea would be better, but that is a subject for a later time. . .) is itself a massive undertaking, cost-wise. If the idea is to support unmanned probes, is there sufficient traffic to justify the infrastructure? One of the reasons I favor settling Mercury is it has at a minimum four times as many launch opportunities to any object in the solar system. Solar sails launched from Mercury are many times more efficient and so develop high velocities faster than Earth-launched counterparts. Sails massing only 3800 kilograms pushing 10,000 kg probes to Jupiter, Saturn etc. would be commonplace. No depots needed. Anywhere. . .
SpaceX is going to attempt another soft-landing after tomorrow's launch to the ISS. If it succeeds, it will be a historic moment in the annals of spaceflight ... the first ever reusable VTOL to & from LEO. Correction: SpaceX launch date is April 13th, not the 11th. I'm marking my calendar to watch the live feed. SpaceX launch of CRX-6 rescheduled to Tues 4:10 pm EST due to weather. Liftoff successful ... gotta wait another 10 mins for the post launch press briefing to hear if stage 1 soft landed on its ocean platform or not. No video yet, but from the lone still photo I saw, Stage 1 scored a near perfect bullseyes on the platform, but it apparently landed too hard, and blew up. So close ... they need to do the final hover burn a little bit higher. Also, judging from the tilt of the barge vs the horizon, it looks like the platform is rolling a bit in a stiff wind. The barge may need a better anti-roll gyro stabilization system. Why, exactly, are they trying to land this thing on a barge? Moonguy » April 14th, 2015, 8:03 pm wrote: Why, exactly, are they trying to land this thing on a barge? The eventual goal is to have a reusable booster, which once perfected will save a LOT of money, as in several million dollars per launch. The trick is getting there, so various concepts and incremental development of same is underway by several firms. For SpaceX, they've already tested said booster on land with VTOL to & from very low altitude (a few hundred feet), but supersonic VTOL to & from 100+ miles is a VERY different animal, so it looks to me like they're doing the initial stages of developmental testing out at sea, where catastrophic mishaps can't kill anyone or cause massive property damage & negative publicity. Once they reliably succeed at sea, they'll relocate everything back to land, and televise everything live for free media glamor ... but they're working out the kinks at sea first. I remember similar promises being made for the Shuttle. I hope SpaceX fares better. . . I thought his question addressed the type of craft. Figured it was obvious why they would try this in open ocean. A barge is a relatively cheap and solid floating platform, compared to other seaworthy vessels. That's all I meant. I keep thinking back to the Aquarius launcher that Space Systems/Loral was designing on about 15 years ago. It was designed to be launched from water. I wonder if Musk/SpaceX ever reviewed that design. . . The truncated piece of chase plane video shows that the landing concept is quite difficult. It looks like the rocket had to change thrust angle in order to hit the center of the deck, which then resulted in a pinpoint touchdown, but with an oscillation in vertical orientation. Any gust of wind can call for a last minute correction like this and I would have thought there should be some other form of fine correction for horizontal movement correction. Rotating the whole length of the rocket is obviously undesirable at that point. Pretty impressive that they got as close as they did. Looks to me like if they increase the fuel reserve by about 1 second, they could do the landing burn ever so slightly higher, and then land under partial thrust. That's assuming the engine can be throttled, and isn't simply a full power on/off affair. There is now a HD video of the SpaceX landing available. Here one can clearly see the top-thrusters working in the last seconds. I think they were supposed to stabilize the angular position before touch-down, but clearly failed to do so, although one can see one side trying to prevent the topple. Did they operate too late, or were they just not powerful enough? 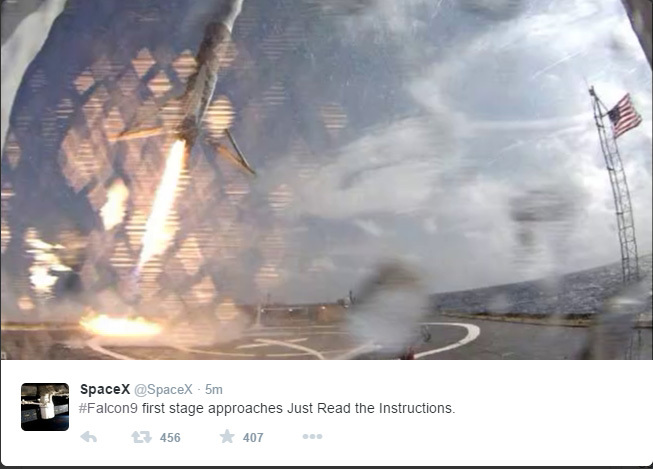 I have not seen anything from SpaceX, who are obviously still analyzing data. I first came across the concept of solar sails when playing role-playing games in primary school, D&D, SpellJammer to be precise. Ahem, like you said, a re-usable booster does seem like the rational ideal. At this moment spacecraft propulsion is limited by our inadequate technology and insufficient understanding about all laws of nature; mainly to ion propulsion I believe. Ion thrusters have an input power spanning 1–7 kilowatts, exhaust velocity 20–50 kilometers per second, thrust 20–250 millinewtons and efficiency 60–80%. But hey, it can be nuclear which is a bonus. Ionization energy represents a very large percentage of the energy needed to run ion drives. The ideal propellant for ion drives is thus a propellant molecule or atom that is easy to ionize, that has a high mass/ionization energy ratio. What I want to see is an ion propulsion system that works within the Earth's atmosphere where other gases might be present - I doubt that will ever be possible as far as I know as turbines would indefinitely be more energy efficient. One article I read a long time ago projected the idea of detonating atomic explosions behind a spacecraft with sufficient shielding to protect it and the boost in distance would be astronomical. A subsequent set of detonations over time (if such a sufficiently system of shielding was provided) would make interstellar travel very viable as would notions of near-like luminescence speed. On a sidenote (to anyone, or everyone), does anyone have enough understanding of the relationship between magnetic fields and the Higgs boson? I don't know why, but whenever I think of futuristic propulsion I always think of magnetic fields but I am aware of how ludicrous such an idea sounds. There are some formidable weight problems in strapping the LHC to your spacecraft.